If you’re a business owner or entrepreneur, you know the importance of branding. Branding is how your target market recognizes you. It’s what sets you apart from your competition. It’s what makes your business memorable. But what is authentic branding? Authentic branding is created using the most essential part of you or your business. The true essence of your identity is at the heart of all messaging. From your website to your social media posts, the feel of your content is truly inline with you or your business. No fluff, no spin, just truth. Authentic branding allows you to connect to your target market on a real, sustainable level. By using who you or your business is to build your branding, it becomes second nature to communicate in your branding voice and communicating your business’ message is natural and not forced. Now that you know what Authentic branding is and why it’s so powerful, it’s time put it in play for your business. 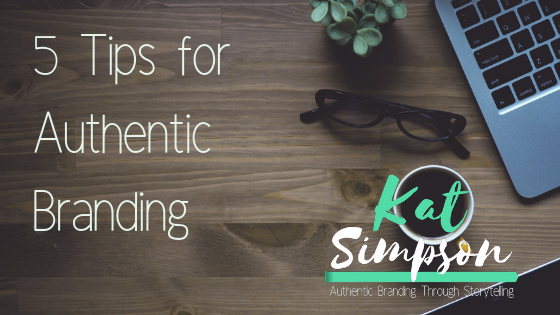 Here are 5 essential tips to creating authentic branding in your business. This may seem overly simplistic, but this is one of the most important steps in creating an authentic brand. Without it, you cannot communicate who you are through your website, your social media efforts, your marketing materials, or anything else. 5 ways to spend more quality time with your children. Blogs like: 5 Hot Toys for Christmas or How Fathers Can Build Their Daughters’ Self-Esteem wouldn’t communicate your why. Now you know who you are and why you do what you do, all that’s left is to know who you want to serve. This is the final part to the branding trifecta. I know, I know… You’re thinking, “you said 5 tips”. I’m not done with my tips, but let me explain. The foundation of any authentic brand is made up of these first three parts. Your heart (who you are), your why, and your who. If you have these three things and nothing else, you are still well ahead of most. By knowing your branding trifecta, you know who to target, what to communicate and how to communicate it. No person or company is perfect, so why would your customers think perfection is authentic. Don’t worry about having everything polished all of the time. Let them see flaws in photos or videos. Don’t edit out everything mistake or blemish. This makes you human… and being human is authentic. Consistency is key to building a brand that your audience can count on. This does not mean just a consistent posting schedule…although that is important too. This is about your message. If you communicate the importance of recycling and using green products one day, and then talk about how efficient using bottled water is the next day, your audience will be scratching their heads. Authentic branding is the most effective branding strategy for your business. Now that you have my five tips for creating an authentic branding, the ball’s in your court. Do you now your company’s heart? Do you know your why? Who are you dedicated to serving? Are you okay with letting mistakes make the final cut? How can you ensure you’re being consistent? Let me know what’s the easiest for you to implement and what’s the hardest. I would love to hear from you.